Preparing this post at 6AM in the morning? Thank you jet lag. As you may have discovered from my countless Snapchat and Instagram updates, I’m currently in Barcelona. My body clock haven’t fully adjusted yet, so here I am, spending my early morning drafting this post. I hope you enjoy it! It’s a simple OOTD, featuring loose-fitting clothes once again. You’ve seen this blazer before, the dress, however, is new–shipped all the way from Australia. It looks like a cross between a shift dress and a tent dress which is why I like it. It’s one of the most flattering silhouettes, especially when the length is cut as short as this. This way, it’s able to conceal a tummy fully-satisfied by a hearty meal while maintaing a little bit of sexiness by showing some major leg action. Easy to pull-off, right? Only you can pull off that outfit. I so like your shoes!! Hi Ms. Camille! I would like to ask if ano pong name ng hair color mo? It really fits you! It still and always will amaze me how you can find out great clothes LOL and thanks to you I can find out too where to buy these amazing clothes! Hi ate Cams, I am a new reader. I am just curious, who takes your photos po? Show off those legs Miss Camille! Many will envy them :D Perfect travel outfit, simple and comfy but not too casual. Your shoes definitely brought your outfit to a higher level. To a higher level literally too haha! Thanks Mary Ann! Hello, Miss Camille! I think you’re making tampo na because I haven’t commented in so long. :-( *sniffle* I hope you still see my comment posts! I’m back online for a few days since I haven’t been able to afford prepaid load in the past weeks. Been reading your recent posts. I’m glad you’re attending the Pronovia show this year! I saw your latest Instagram post on one of those behind-the-scenes peeks into their closet areas. Everything looks so pretty! I can’t wait for each gown’s runway moment! For this OOTD of yours, I would steal this dress from your closet. Really. If I were to raid anyone’s style collection, it would be yours. I’d start with this dress. The silhouette may be vying for a spot among the classics, but it’s the printed vertical lines I love. The fact that each line looks like a pretty doodle just adds to the charm. :-) I especially like— no LOVE the way it looks in the third to to the last photo. You pull off the effortlessly- chic look wonderfully! Oh, and in your 5t photo, I noticed a new angle to your face in the pose you held. I call it your Heartbreaker Look. :-D The edge that your eyeliner gave your eyes is a great contrast to the feminine white of your dress. I also confess: I thought your Chanel bag was a backpack! I like how cozy it seems. If a picnic basket had a designer alter ego, it would be your backpack. :-D I’d use it EVERYWHERE! P.S. Wear these shoes more often! I love the pump they give to your feet and long legs. They’re my new favorite pair of footwear that you blog. Oh don’t worry, I’m not tampo and of course I still read and answer your comments. They are much appreciated. :) The Chanel bag IS a backpack! Super cool right? It’s one of my ultimate favorites :) And don’t you worry, I’m definitely wearing more of these heels. Great OOTD! Dresses like that make me feel casual but flirty all at once. After seeing yours, I’m tempted to shop for a similar look! I have to agree. The dress is indeed flattering and with vertical stripes too! Extra slimming. ;) I happen to love those shoes too Cams. I think your shoe closet is one huge paradise. 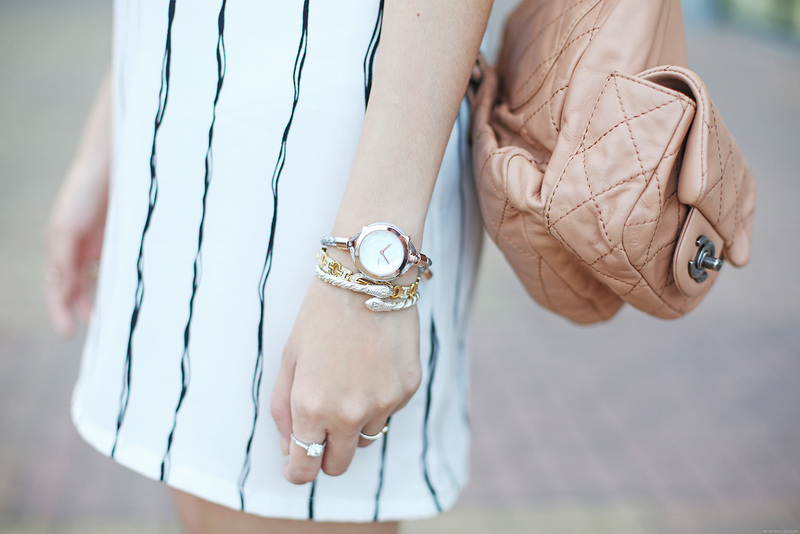 I love how simple and chic the dress is! We owe ourselves a bit more forgiving things particularly after a long haul flight, AHH jet lag, thankfully to me it’s still a fabled affliction, and I hope it stays that way!